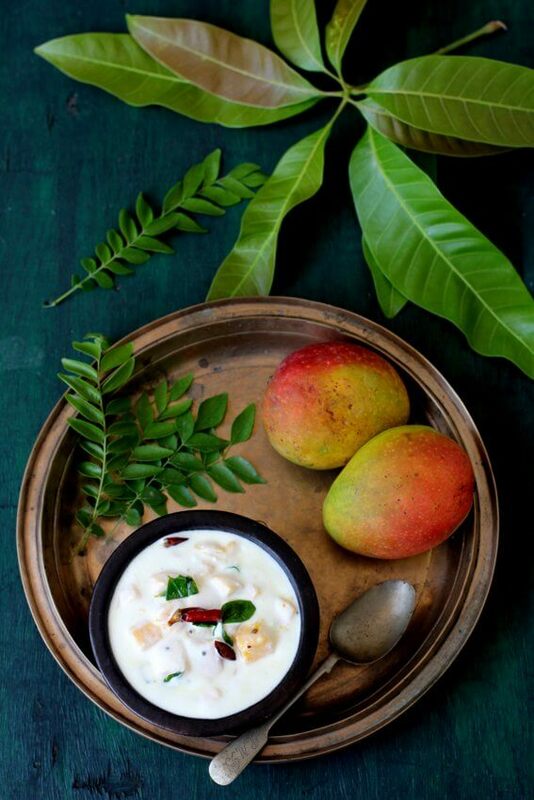 Mamidipandu perugu pachadi is an Andhra style ripe mango yogurt chutney that’s perfect to beat the heat. One of the best-chilled yogurt recipes for cooling down when the summer heat is at its peak. Our backyard mango tree has given us a good yield this year and we could harvest quite a few mangoes before Ugadi, Telugu new year. We have been relishing the sweet mangoes, Suvarnarekha variety, in various avatars and one of them is Andhra style sweet mango chutney. It is a lip-smackingly good flavor combination. Not only is it refreshing, delicious, hydrating, filling and simple to make, it is also rich in calcium, with probiotic benefits, full of fiber and antioxidants. 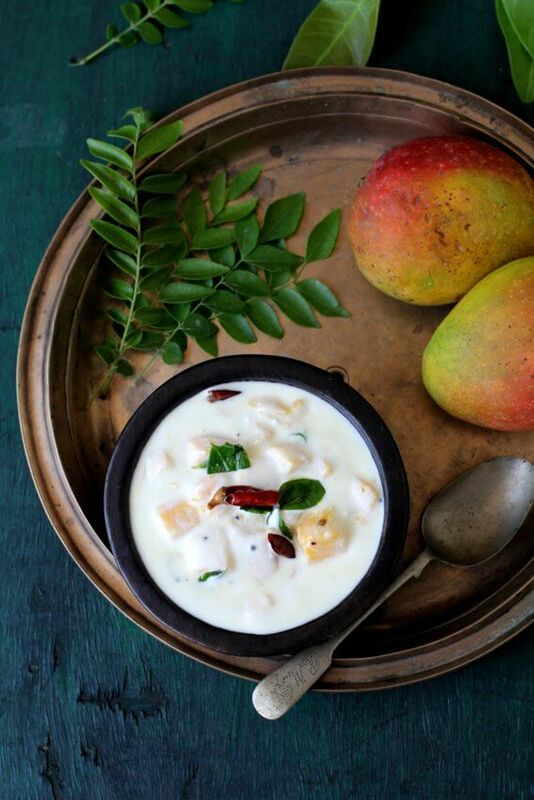 This mango yogurt chutney is slightly different from the North Indian style mango raita. There is no tempering of spices in the raita version while the Andhra version calls for tempering of red chilies and curry leaves. Your palette will be overwhelmed with the flavors of mamidipandu perugu pachadi. The soft, silky smooth textured beaten yogurt is infused with a tempering of red chilies and the sweet flavor of ripe mangoes. A hard to resist chutney that can be served as a dip, condiment or a side dish. I can eat a bowl of this pachadi as a meal by itself. The natural sweetness of mangoes is enough and you do not need any extra sweetness. If the mangoes are fully ripe, you do not need any extra sweetness. You can add a dash of honey in case the mangoes are slightly tart. 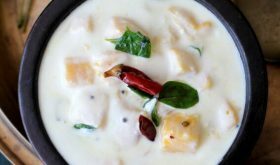 You will need less than 10 minutes to whip up a large bowl of Andhra style ripe mango chutney for your family who will love this refreshing, creamy and nutrient rich pachadi. 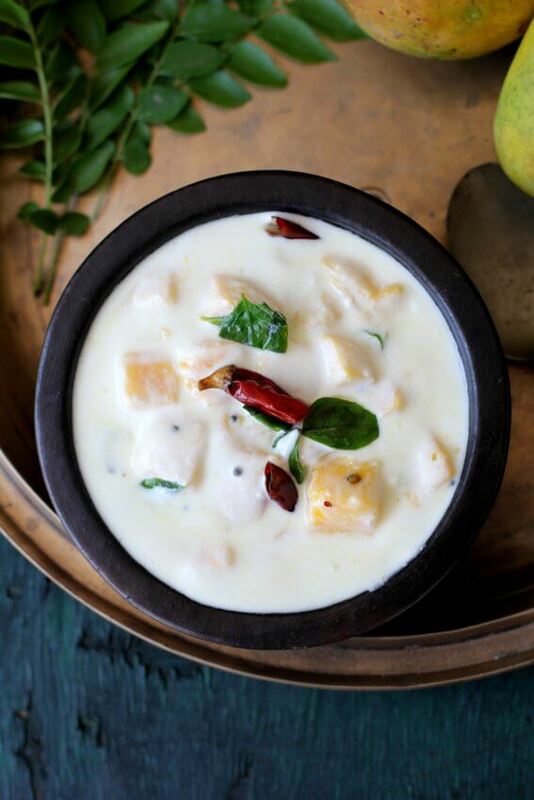 A gluten free, vegetarian, healthy pachadi perfect for the Indian summer heat. My blog is home to a lot of pachadi varieties from Andhra and South India and I hope to add more pachadi recipes this month especially using raw mangoes. You can look forward to a LOT of raw mango and ripe mangoes recipes on the blog over the coming weeks. Tomorrow, I will post North Indian style mango raita recipe. In a bowl, beat the chilled thick yogurt till smooth with a whisk. Add 1/4 cup water and mix well. Add the chopped ripe mangoes and salt and mix well. Heat oil in a small pan, once hot, add mustard seeds and allow to splutter. Add the red chilis, asafoetida and curry leaves and saute for a few seconds and turn off heat. Add this tempering to the curd-mango mixture and mix. Chill in refrigerator until use. 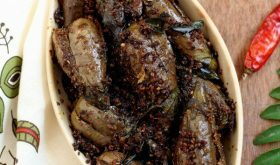 You can serve it as a meal by itself or as a side dish. Use fresh, homemade thick curd that is not sour. Use good quality, sweet mangoes. If the mangoes have a slight tart flavor, add a dash of honey or sugar to the beaten curd. You can also add a chopped green chili in the tempering once the mustard seeds splutter. You can add chopped coriander leaves or mint leaves as garnish.